But, Grandma, you look so young! Just the line that every lady wants to hear as they are getting up in age. Aging can be a rough ride for many of us. We tend to think how fun it might be to sit in the role of the old granny and smile, saying, "Oh, come a little closer deary, so I can see you better. And, pass me my cane, will ya?" But, stepping into the real role can be a tad more tiresome. If only we could get a test ride and enjoy some of the moments a little early. Perhaps be like those delightful old dancers who visit Bialystock and Bloom who still manage to pull off some crazy leg work that most of us would pray to do even in our youth! Now you can age decades in a matter of minutes. 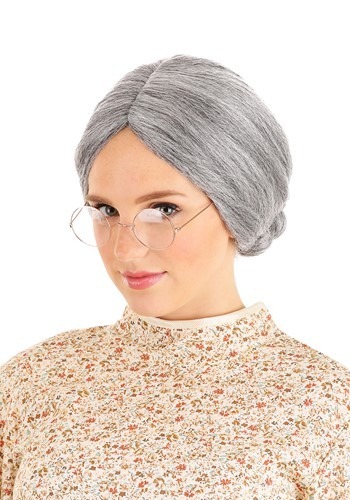 Look older and, indeed, wiser when you wear this Grey Old Lady Wig. You can decide if you want to be a sweet old grandma and bake cookies or a cranky one and yell at all the kids that wander on your yard. Either way, the synthetic fibers in their perfect low bun fashion will make for a delightful granny look. Now, though, you’ll have to figure out what else to accessorize this gorgeous look with! Cane, broom, or walker! ?